Who says there are no characters in football anymore, particularly in the lower leagues? Anyone who was lucky enough to be around the tunnel area shortly after the final whistle at the One Call Stadium on Saturday would have seen a remarkable sight. Crowds of young fans waited for their cult hero, Wycombe Wanderers striker Adebayo Akinfenwa, to emerge from the dressing room after the 1-1 draw with the Stags. The burly striker, known as The Beast, is now much loved up and down the country and it again showed early on Saturday evening. Akinfenwa took time out to high-five the youngsters, sign countless autographs and pose for even more photos. It was the same the last time the striker came to Mansfield, then for AFC Wimbledon, when he received a similar reaction. On that occasion the threat from The Beast, who won many headers on Saturday despite being well marshalled by a back three of Krystian Pearce, Lee Collins and the returning-from-injury Kyle Howkins, was nullified by a terrific, tigerish display from Jamie McGuire. It was a great spectacle - the man-mountain tamed by the diminutive McGuire. But the respect between the two was obvious on Saturday in that same tunnel area when Akinfenwa and McGuire met again. This time Akinfenwa had McGuire in a playful armlock. No doubt The Beast was delighted that injury had ruled McGuire out of Saturday’s match – Stags boss Adam Murray certainly wasn’t! Over recent years I have often championed McGuire against criticism over the midfielder’s quality with the ball. Aside from his ability to always be up for a battle, to do the ugly side of the game well, I have pointed out that the enthusiastic Scouser is a terrific leader. Even when he is not captain, McGuire urges and cajoles the players around him to be up for a fight, to keep battling and to never give up. During a game, he both praises and criticises his colleagues to get the best out of them. It was those qualities, so much to the fore in the previous weekend’s thrilling 3-1 derby victory over Notts County, that the Stags missed in the first half on Saturday as Wanderers dominated and deservedly led. It was a tepid first 45 minutes from the home side, very much a case of after the lord mayor’s show following the heights of seven days earlier. Murray was not happy after the final whistle. 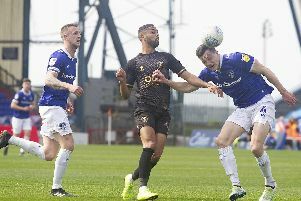 Yes, the Stags fought back well to deservedly earn a point through Matt Green’s seventh goal of the season, but there was none of the fight for at least 45 minutes that McGuire would have demanded from players around him had he not been injured. McGuire’s injury was bad luck for the Stags, as was Green’s illness that made Murray again keep his star striker on the substitutes’ bench. When Green and Jack Thomas, in his first action of the season, arrived at half-time the game undoubtedly changed. Third substitute Darius Henderson also had a positive impact. But as Murray was at pains to point out after the final whistle, all of the Stags players have it within them to be characters, to be leaders on the pitch and to dominate games with their endeavour, passion and ability. The manager now has to find a midfield combination that will give him that drive when the likes of Collins and McGuire are absent or, in Collins’ case, playing in defence. Of course, consistency at this level is also always a key – as is that little bit of luck. A week earlier Henderson came off the bench to net the clincher against Notts County in stoppage time. This time, deep into the extra minutes, he looked likely to be the hero again until his header was spectacularly tipped away. Fine lines ... but, despite inconsistent results at the One Call Stadium, the Stags remain one point off the play-off zone and have the second best defensive record in the division. You can see pictures of the man himself with young fans after the game by logging onto our Chad Stags Facebook page. CLICK HERE for more.